Deadly MINT card stock throughout. Among the premier rookies from the '50s and sought after in PSA 8. The offered specimen is a freshly graded gem which ranks among the finest examples we've brokered in recent months. The offered copy boasts near perfect 50/50 centering, an incredibly rare quality for the issue. The corners are minimally MINT, the edges are crisp and the color is strong. An all around gorgeous card which is deserving of attention. 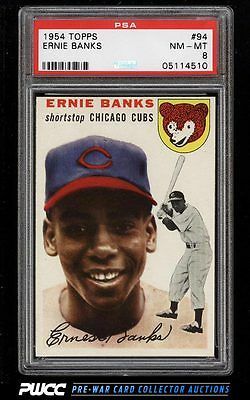 One of over 11,000 cards, lots, and sets up for bid in our 9th Auction of 2016. Click on the link above to view the other PWCC auction lots.